The National Automotive Innovation Centre at University of Warwick will bring together academic excellence with real life work experience offered by Jaguar and Land Rover. NAIC will create and develop technologies to reduce dependency on fossil fuels and to help reduce CO2 emissions. As well as housing and some of the most advanced automotive technology, the NAIC will also look to secure a strong supplier base in the UK. This £150 million facility is a joint venture by car giants Jaguar Land Rover and the University of Warwick. The building has been designs to be clean and simple, its richness and quality comes from its strong base and the heritage JLR brings. 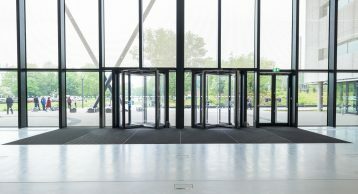 This is evident in the design of the front of the building which accommodates the main reception and exhibition area with a clear view into the Engineering Hall. Maintaining a high quality aesthetic therefore was critical for the architect. At Intrasystems we strongly believe a clean reception creates a lasting impression. 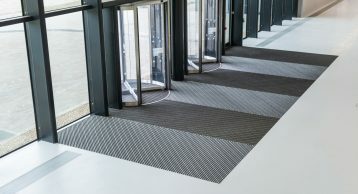 In light of showcasing the advances in British design and engineering, only the best Entrance Matting would suffice for this building. 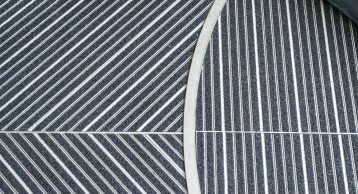 As a result, we recommended the INTRAform Drainable Entrance Matting in Open construction to allow excess moisture to fall away into the matwell. 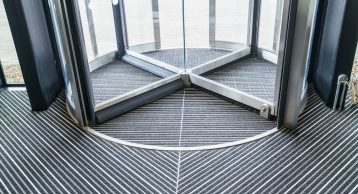 Combine this with a unique chevron pattern and the whole entrance is enhanced creating stunning aesthetics for the building. 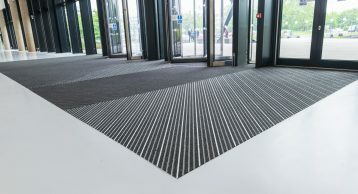 To maximise the performance of this Entrance Matting we used our most popular INTRAlux Elite fibre which is known for its effective moisture absorption of 5.4l/m². 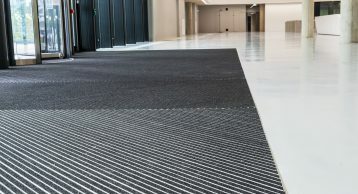 Made from 33% recycled econyl yarn, we are proud to contribute towards the buildings ‘Excellent’ BREEAM rating. 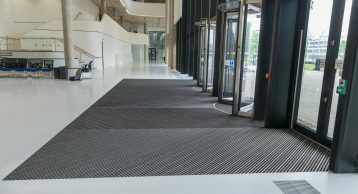 Working on this project has given us a great opportunity to showcase our British manufactured Entrance Matting and add to the overall look and feel of the facility.